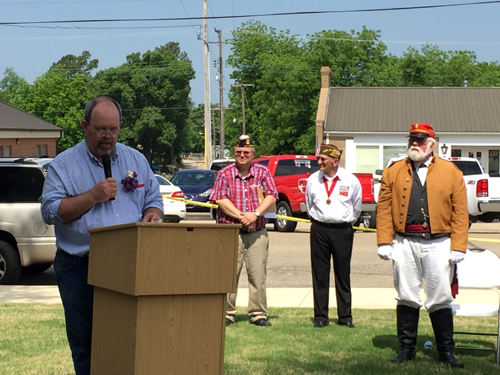 Poinsett County Commemorative Day was declared on May 18th 2018. 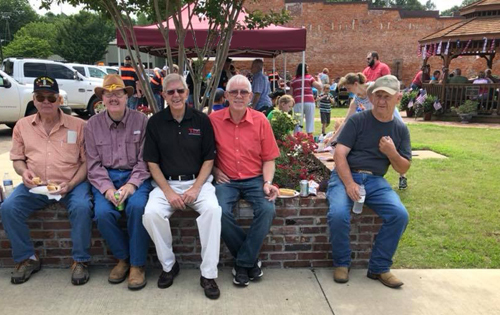 To celebrate the 100th year of the Poinsett County Courthouse there were several events planned. 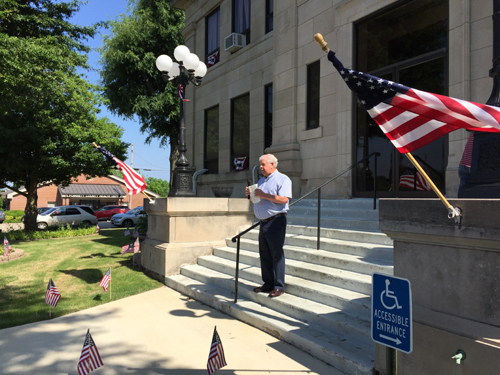 County Judge, Bob Cantrell, welcomed the crowd from the Courthouse steps. 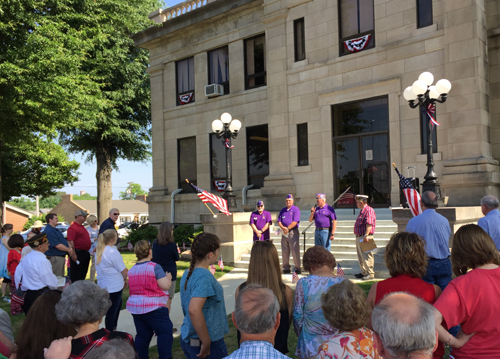 Commander Everett Evans, NEA Chapter of the Military Order of the Purple Heart announced that Poinsett County has completed the requirements to be designated a Purple Heart County and presented Terry Long, Veteran's Service Officer a plaque. 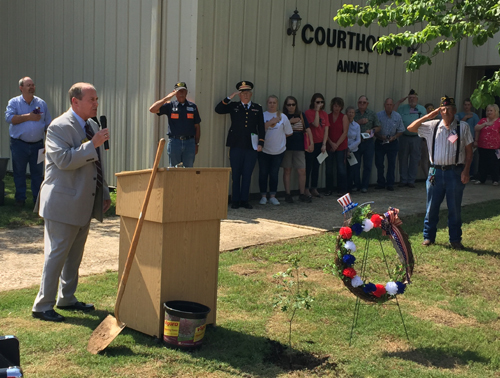 The crowd moved to the Courthouse annex where Poinsett County Veteran's Service Officer, Terry Long dedicated the WWI Shumard Oak tree in the Annex yard. 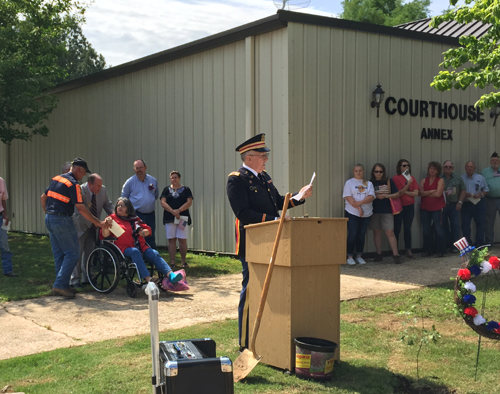 Trees were provided by the the Arkansas World War I Centennial Commemoration Committee and the Arkansas Forestry Commission to remember the 71,862 Arkansans who served during the Great War, including the 2,183 who died while in service. 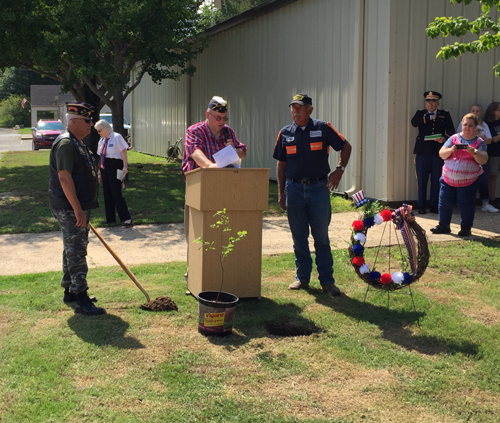 The tree was planted by veterans, Alvis Lowery and Ron Taylor, with soil from the Meuse-Argonne National Cemetery in France. State Representative Johnny Rye, Jr. sang our National Anthem. 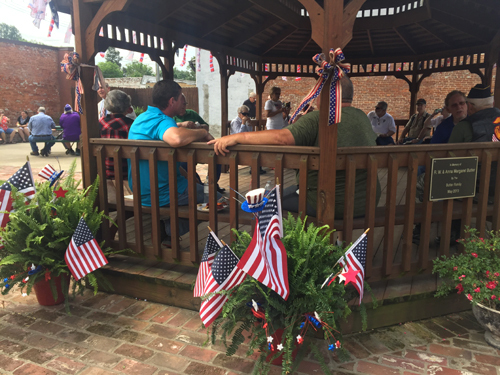 Captain Richard Hartness, Professor of the ASU Dept of Heritage Studies, spoke about WWI and its impact on the country and read a letter from a Poinsett County soldier to the Modern News that was written while he was in France. The next event was held on the Couthouse lawn. Curtis Sanders with the Poinsett County Historical Society told about the Poinsett County Courthouse and its construction in 1918. 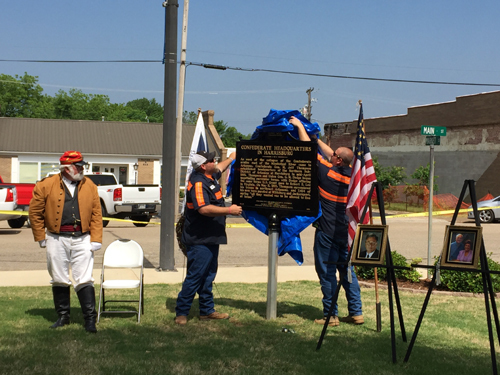 A Civil War Marker was unveiled. Harrisburg is listed in historical records as a headquarters of the northern Sub-District in mid-April 1865. The Arkansas Civil War Sesquicentennial Historical Marker Program is just one way in which the Arkansas Civil War Sesquicentennial Commission is fulfilling its mission to support a statewide observance of the 150th anniversary of the American Civil War that is educational, comprehensive and inclusive; that tells the story of the Civil War in Arkansas without making judgments about the actions and motivations of the people who took part in the war; and that stresses the relevance to Arkansans today by promoting local observances and acknowledging the impact the Civil War had on modern Arkansas. The Commission encourages local groups and organizations to sponsor markers that will help to tell the story of the Civil War in Arkansas and how it affected every area of the state. The Commission hopes to see at least one marker in each of Arkansas's 75 counties. To end the ceremony, Taps was played and a prayer was offered for our County. 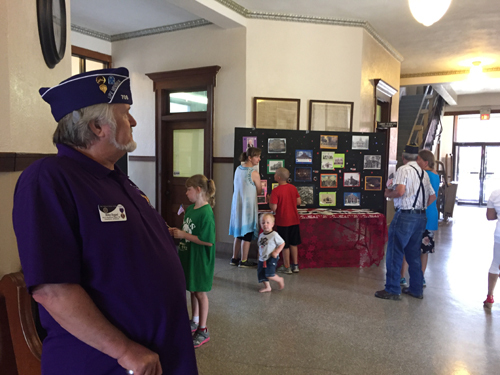 After the ceremony, attendees were able to visit the Couthouse and view displays made by Sylvia Evans with the Poinsett County Historical Society. 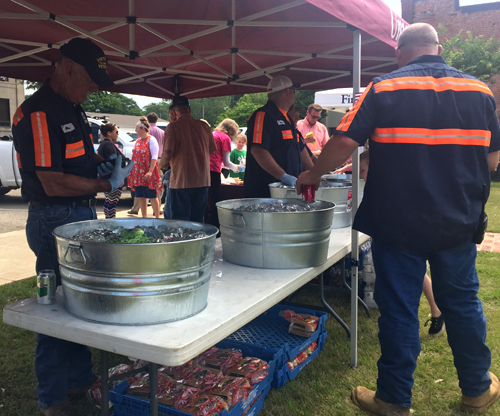 Outside at the Veterans Park a hotdog lunch was served complete with chips and drinks. 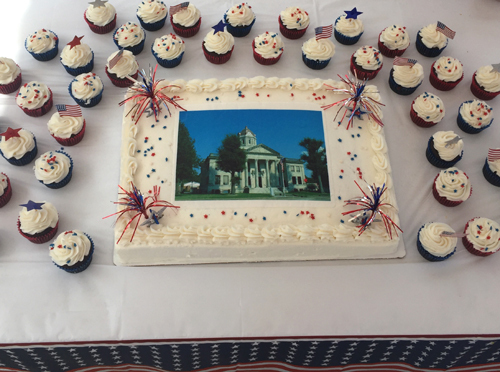 Courthouse birthday cake was served. 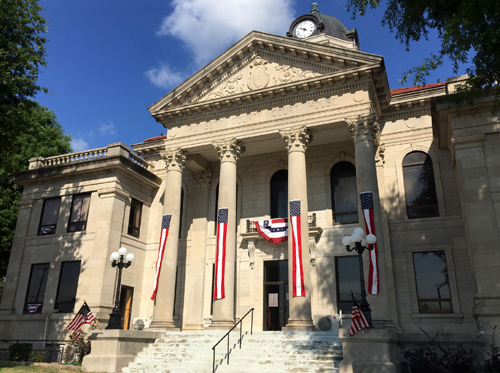 The Poinsett County Courthouse was built in 1918 and still serves at the office building for county buisness. Courtsquare was decorated in patriotic colors and flags. The event was well attended. Some of the VIPs were: Lt. Col. Joel Lynch, Brigade Executive Officer at Arkansas Army National Guard, Arkansas Senator David Wallace, State Representative Johnny Rye. Jr,. State Representative Dwight Tosh is pictured below with friends. There were also many local elected officials and veterans. We are grateful for their service.